Now, we are passionate trackers of this Lok Sabha election. We recently conducted our own Opinion Poll (You can see results here). A lot of people who follow me on facebook are convinced that I am obsessed and have some kind of a disease. Well, it is an extraordinary election as per me. Young voters. First-time voters. The role of the internet. Media Explosion. Advent of Big Data. The Aam Aadmi Party. Narendra Modi. Telangana. The precarious situation that the country’s economy was a few months back (and according to many it still is) makes it a critical election. One of the things that is closely followed because of so much more media are the Opinion Polls. There are over 100 active TV News channels. The internet throws up hundreds of surveys and practically anyone today can conduct a survey online with a decent sample size. We are about a month away from the Results. I thought it was a great time to take a look at what happened exactly a decade back as far as Opinion Polls/Exit Polls are concerned. I took April 2004 and not April 2009 because unlike 2004, in 2009 the Congress and UPA was always ahead of the BJP and NDA. Plus, the general feeling in 2004 was that the NDA would easily come to power. In 2014, while everyone is cautious about clearly declaring BJP led NDA a winner, most polls suggest that they are overwhelming favorites to be the single largest group in the Lok Sabha. In 2004, exit poll results publishing while the polls were on was not banned. In fact it was the first general election when Opinion and Exit Poll became part of mainstream media coverage in a big way. It was said to have such an impact that Political parties and the Election Commission decided that no exit poll results would be released publicly while the elections were on after the 2004 Lok Sabha elections. Hence, we generally see opinion polls results about 2-3 days prior to the first voting day and exit poll results are released after 7 pm on the last voting day of any election. This time round channels like NDTV have announced results of their opinion polls (conducted well before the first voting day) during the election which hasn’t been the norm over the last decade. However, note that they are results of the opinion polls and not exit polls. Exit Polls are generally accepted to be more accurate than Opinion Polls. In Jan-Feb 2004, it seemed as if the BJP led NDA was unbeatable. All opinion polls without exception gave the NDA a thumping majority. Some even predicted over 330 seats for the alliance. However, by March there were a few signs that the margin of victory would not be as big as predicted earlier. 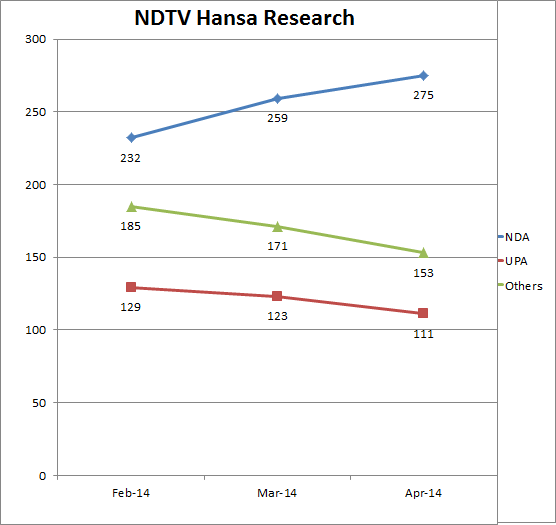 From 335 in Jan, the Opinion Poll in April had scaled down the NDA lead to 282 by April . After the first phase of Polling was over, the NDA was in the lead and above the majority mark but things had started to get a little uncomfortable. This outlook article says that most channels were predicting around 270-280 odd seats for the BJP after the first phase. But to keep things in context, the NDA has called an early election when they expected to win between 330-350 seats in the 14th Lok Sabha. This is when the real story started unfolding. NDA was ceding ground everyday and the Congress started becoming more confident with every phase. I remember following Aaj Tak and NDTV and noticing this as a viewer. I had just finished my Class 12th exams and was waiting for Umang HOD selections to start and had a lot of time to watch TV. NDA losing steam reported Rediff after polling for 278 out of 543 seats was over. The predictions now scaled down to 260+ for the NDA. Below is a graphical representation of exit poll results after phase 2 from Rediff for 278 seats on April 26th 2004. What is clear from the above links is that the broad trend of the BJP led NDA dipping had been identified by all polls. 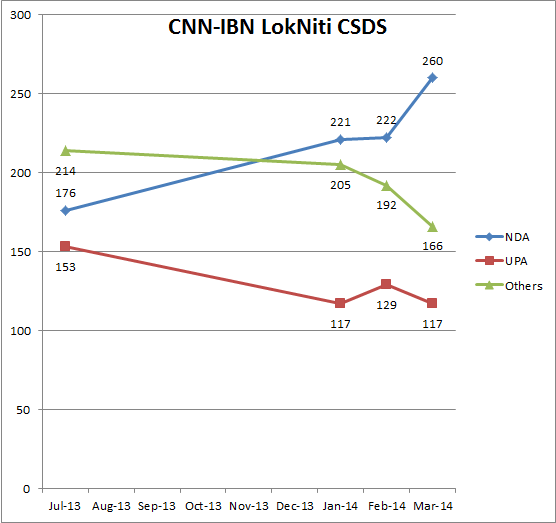 By May 2004, the NDA lead had fallen even more and many expected the NDA to not cross 250. However, what they got wrong was the extent of the slowdown. The final tally was NDA – 185. Most of the NDA allies like TDP, Shiv Sena and AIADMK were big losers which hurt the BJP even more. BJP’s tally was reduced from 180 to 138. The Congress party with only 145 MPs formed a government and lasted its full term of 5 Years! Exit Polls results publishing is banned so there cannot be a direct comparison with April 2004. Exit Poll results will be out on 12th May after 7pm. The interesting thing is that exactly 10 years apart in April at this point, the tally projected for the BJP led NDA roughly remains the same. It was about 270-280 in 2004 too. The latest opinion polls by CNN-IBN and NDTV give similar indications. However, what is different this time is that the trend is in the reverse. The Modi juggernaut seems to be gathering more steam every passing day as per the opinion polls. Even the fiercest critics of Modi in the media are now very cautious and do not dismiss the likelihood of Modi becoming PM anymore. Over the last 4 months, poll after poll suggests that the BJP and the NDA is gaining steadily. From about 160-180 seats for the NDA projected by various Polls in July 2013, we are now looking at a prediction of 250-270 on an average for the NDA. Over the last 10 months, a lot has happened in Indian politics. Modi being anointed as BJP’s PM candidate, the Aam Aadmi Party’s victory in Delhi Assembly Polls and the subsequent antics for months, the complete lack of focus on regional satraps by the media (when was the last time you saw Mayawati or Naveen Patnaik on National TV?) and most importantly – record registrations and turnouts of young and first-time voters. You can check the Wikipedia link for the other Opinion Poll estimates. Of course, according to Arvind Kejriwal all this is ‘hawa’. He says BJP will not manage even 150 seats. According to most AAP supporters, everything has been paid for in the media. Most opinion polls are rigged in favour of Modi. They do have a case if the argument is previous track record of Opinion Polls in India which is quite patchy. Personally, my limited experience of following elections tells me that when such a secular trend is clear in Opinion Polls, the final result only adds to the tally of the leader. We will know only on May 16th.